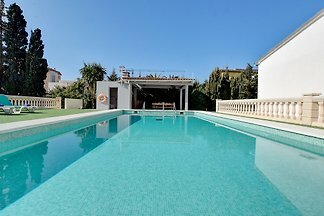 Set in Badia Gran in Majorca South, this stylish villa features a private pool, spacious terraces and welcomes 6 guests. Beautiful two storey town house, located in the coastal and quiet urbanisation of Tolleric. It offers a private pool and accommodation for 6 to 8 guests. This Mediterranean house for 6 people is situated in the quiet urbanization of Badia Blava and is ideal for summer holidays. Welcome to this modern villa in Sa Torre, Llucmajor. It sleeps 6 people. Beautiful chalet with private pool in the quiet urbanisation Sa Torre, for 8 or 9 persons. Wonderful villa with private pool and near the sea in Bellavista - Llucmajor. It has capacity for 8 guests. Spectacular 3-storey luxury villa in the upscale residential area of Son Veri Nou, located in the coastal area of Llucmajor. Beautiful house with private pool in the marvellous area of Cala Pi, with capacity for 8 people. Stylish house with private pool in Cala Pi, prepared for up to 6 persons. Stylish Finca with private pool and garden in Llucmajor, 15 minutes drive from Palma de Mallorca, ideal for 10 people. This wonderful chalet in Cala Pi, close to the sea, welcomes 6 people. This lovely terraced house with communal pool is set in Cala Pi, in the south-east of Mallorca and can comfortably accommodate 6 guests. Magnificent villa located in a residential complex of the coastal area of Cala Pi. It consists of 240m2 building. Rent successfully your holiday flat or holiday home in Badia Gran in only 20 minutes !